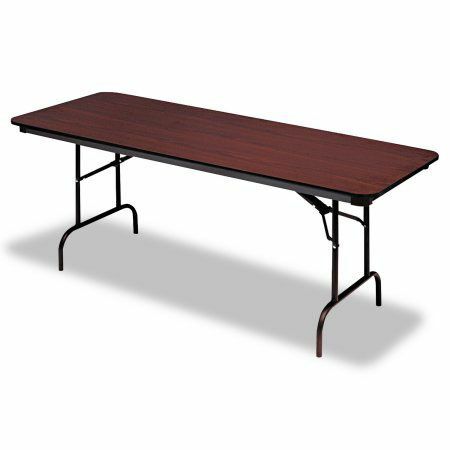 Designed for use in high-demand situations such as classrooms and banquet settings, McCourt's Laminate Table has a very sturdy construction with six design choices to match any location. The baked-on polyester coating is very tough with great weathering properties, all while maintaining a smooth and elegant appearance. McCourt offers three different options for leg styles including the Spring Lock Square Style, the Roman Style, and the “L” Style (other styles are also available upon request). Speaking of table legs, you won't have to worry about skid marks because this Laminate Table has high-quality nylon glide feet inserts. Do your floors a favor and upgrade your current tables to tables by McCourt Manufacturing! • Six standard Wilsonart® Laminate choices with the option to choose from the complete Wilsonart® line. 3/4” plywood core of a minimum 7 ply board with no splices, voids or plugs. Wilsonart® high-pressure laminate on the top surface with a backer sheet on the underside. Six stock laminate choices, other options available upon request. Frame constructed of steel rails and folding legs. Rails are roll formed of 14 gauge coil and fitted to ABS plastic corners. Legs are fully welded of 16 gauge 1” dia. tubing with braces of 11 gauge stamped steel. Standard legs style is wishbone except on 18" wide seminar tables which use “H” style legs. Detent leg locks securely in the fully open and fully closed positions. Frame and legs are industrially cleaned for rust resistance and superior paint adhesion. Black baked-on polyester powder coating has outstanding toughness, excellent weathering properties, and a smooth appearance. Legs capped with high-quality nylon glide inserts. Standard edge molding is T-style Bull-Nose black vinyl edge. Frame and legs are secured to the tabletop with screws. Standard table height is 30”. Modesty Panel - 9” wide with the same construction as the table top. Folds for storage. - Spring Lock Square folding legs made of 1.5” square steel tubing. Tension spring and over-center mechanism provide positive locking in the open position. - Roman Style in 1.5” diameter steel tubing. Detent leg locks securely in the fully open and fully closed positions. - “L” Style in 1.5” diameter steel tubing. Detent leg locks securely in the fully open and fully closed positions. Full 2 year limited warranty against manufacturing defects under normal use. McCourt Manufacturing will repair or replace (at our option) at no charge; customer assumes all freight charges.